Rihanna has some great advice for her younger self—and honestly, you should follow it too. "Sleep," she told E! News. "Because you're not gonna get to do it in your twenties or your thirties, the way my thirties are starting out." 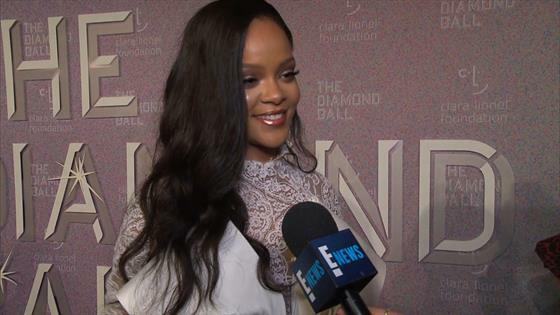 "It's been hectic but I love it," Rihanna added. "I love to do stuff. I get bored otherwise, so I like to keep myself busy." The 30-year-old R&B singer, fashion icon and makeup mogul made her comments at her recent 2018 Diamond Ball, benefiting her Clara Lionel Foundation, at Cipriani Wall Street in New York City. Rihanna began her music career more than a decade ago. She released her hit debut album, Music of the Sun, and single, "Pon de Replay," in 2005. A year later, she earned her first No. 1 track, "SOS." In 2007, she released what would become her biggest hit single, "Umbrella," featuring Jay-Z. In 2016, she dropped her most recent album, her eighth major studio record, Anti. In 2017, Rihanna partnered with LVMH's Kendo Brands to launch her own cosmetic company, Fenty Beauty. It has helped raise her net worth to an estimated $210 million, according to Forbes.